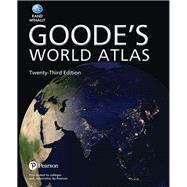 Goode’s World Atlas by Rand McNally helps students navigate through global and regional landscapes with ease. With color-coded headings and charts, brief introductions to each section, and more than 60 new reference and thematic maps, the 23rd edition gives you a comprehensive view of the world and its changing population and physical characteristics. Available soon in Pearson eText and Pearson Custom Library formats. Goode’s World Atlas has been the world’s premiere educational atlas since 1923, evolving with the world that shapes its content, and allowing for a deeper, more global understanding of geography. Goode’s Atlas is named for John Paul Goode, who created the atlas and served as its editor for many editions. Goode was one of the first U.S. academic cartographers. He was born in rural Minnesota in 1862, received his bachelor’s degree from the University of Minnesota in 1889, and earned his doctorate in economic geography from the University of Pennsylvania in 1903. He spent much of his professional career at the University of Chicago. Among his many accomplishments he is perhaps best known for the development of the Interrupted Homolosine projection, which he first presented at the Association of American Geographers meeting in 1923, and which has been used extensively in Goode’s Atlas and in many other geographic publications to the present day. The Homolosine is a composite of two projections, the Mollweide (Homolographic) and the Sinusoidal. Goode interrupted the Homolosine over the oceans to minimize distortion of shapes over continental land masses. Lines of latitude on the Homolosine are straight lines, to facilitate analysis of comparative latitudes. Also, the projection is equal area. Goode was a strong proponent of equal area projections and an equally strong opponent of the Mercator projection, widely used in the early part of the 20th century for world maps. As Goode stated in the introduction to the 1st edition of the atlas (1923, p. x), the distortion of area on the Mercator projection is so extreme that “it becomes pedagogically a crime to use Mercator’s map” for studies of areal distributions such as population density, rainfall, or sizes of countries. Under Goode’s editorship the atlas doubled in size. The 1st edition of Goode’s School Atlas contained 96 pages of maps. The 4th edition (1932), the last edition that Goode would edit before his death, contained 174 pages of maps. Goode introduced many of the thematic map topics that are still found in the atlas today, including world economic maps of agricultural commodities, minerals, energy, and international trade. These topics reflect Goode’s interest and training in economic geography. experts in specific subdisciplines of geography. Examples include natural vegetation by A. W. Küchler, physiography by Erwin Raisz, climate regions by Glenn Trewartha, and agricultural regions by Derwent Whittlesey. By relying on the research of these and other scholars, Espenshade was able to incorporate the latest advances in the study of geographical phenomena. Espenshade also oversaw the creation of a new reference map series, which included hand-drawn shaded relief for the first time in the atlas. These reference maps were introduced in the 11th edition (1960). Joel L. Morrison, then at the University of Wisconsin, joined Espenshade as associate editor on the 14th edition (1974). Morrison, who had a distinguished career in academia and the federal government, was affiliated with the atlas through the 19th edition (1995). In the 1970s and 1980s the atlas saw numerous innovations, including the introduction of ocean floor shaded relief maps, reference maps of major world cities, a continent environments map series, and the first use of cartograms. The 19th edition was Espenshade’s last as editor. On that edition, John C. Hudson assumed the role of associate editor. Hudson, a distinguished academic geographer at Northwestern University, then took on the role of editor for the 20th edition. Hudson introduced many new thematic maps, including world ecoregions, origins of plants, refugees, conflicts, and oceanic environments. Howard Veregin of the University of Minnesota succeeded Hudson as editor for the 21st edition. Veregin then moved to Rand McNally to serve as director of geographic information services and, in that capacity, edited the 22nd edition. Under Veregin’s stewardship, the atlas became all-digital, with most maps produced using geographic information systems (GIS) technology, including numerous new thematic maps. Christopher Sutton was named editor for the 23rd edition. Sutton was a member of the geography faculty at Western Illinois University. Sutton expanded the Atlas, introducing more than sixty new world thematic and regional reference maps, and an updated design. Throughout its history Goode’s Atlas has adapted to changes in cartographic technology, map design, and geographic curricula. However, it has always maintained the pedagogical foundation that John Paul Goode established in the 1st edition in 1923. It should be seen first and foremost as a work of scholarship, incorporating the latest insights into geographical research and knowledge. It is also a fascinating portrait of almost ten decades of evolution in geography and cartography.